Petra Zanki’s 365 – A Solo was laced through with small beauties, but you needed to look carefully to see many of them. This was a quiet performance, a welcome respite before the usual holiday weekend hullabaloo. 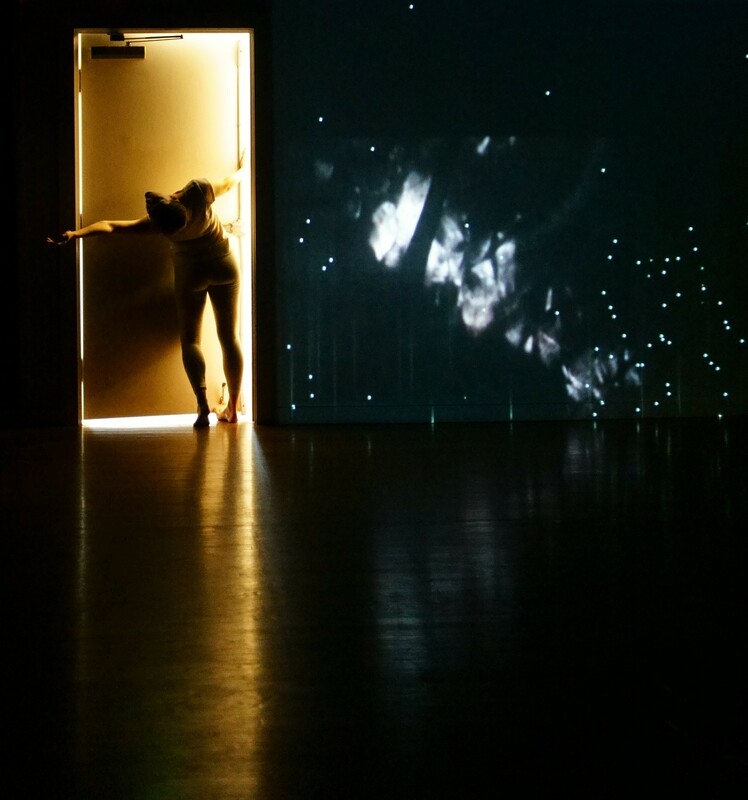 The house had a not-quite-ready feel to it at the start of the evening, with a small pile of electronics on the floor at the edge of the performance space and the upstage curtain pulled back a few feet, so that the mirror reflected the audience to itself. When soloist Lauren Linder entered while the house lights were still up, we wondered if perhaps she’d jumped the cue, but she didn’t seem at all flustered. She looked around, but just when the audience started to settle down, the lights black out. We heard Linder moving in the dark, but when a cloud of dappled light came up in a corner of the stage it acted almost like camouflage, keeping us from seeing her clearly. Like a deer in a thicket, we didn’t really notice her until the door in the upstage corner opened and we saw her arms reaching up, framed in the doorway, silhouetted in the suddenly bright light. This pattern played itself out over and over again through the evening – like a sleight of hand artist, Zanki pulled a cloth out from under a table full of china, so deftly that we didn’t see the trick coming despite the repetition. She used light to focus attention or distract expectations in small, subtle ways, so that a sudden shift gave us an almost visceral jolt. 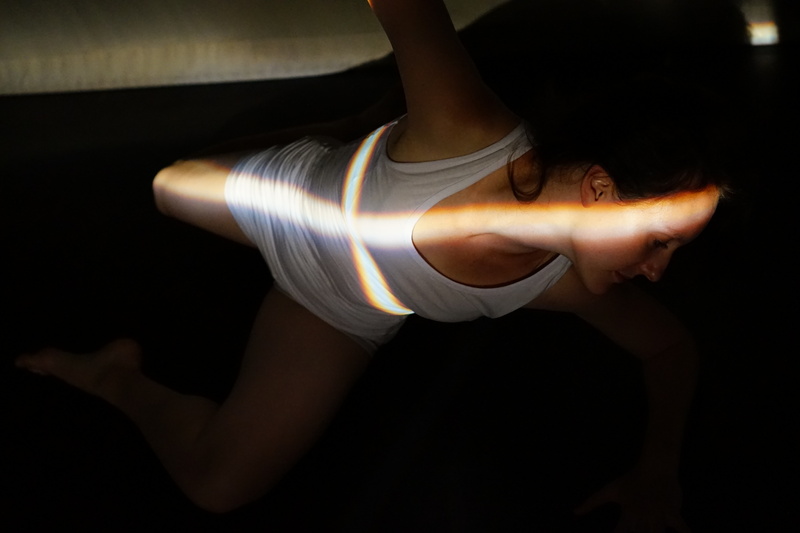 Zanki’s program notes described a dark room where the sunlight moving across the wall felt like another character in the work, and she did use light as an active part of the choreography. She shifted from moments with light levels so dim that you felt you might be hallucinating to a brighter and more closely focused pool of illumination that left everything else literally in the dark. Linder, dressed in what could pass for pajamas, danced with a kind of modest virtuosity through most of 365. Her physical presence was clear and precise, but instead of the “look at me” vibe of many solos, she managed to perform with a sense of isolation – we could watch, but she wasn’t really doing this for us. Even at moments when she faced the audience, there was a sense of distance. Most of the work had a soft, sotto voce feeling, matched by Erin Jorgenson’s vocal inflected score. Often the lyrics were performed so quietly it wasn’t possible to distinguish the text – when the words did emerge more clearly, they suggested homebodies (an admonition: “don’t go anywhere,” a list of kitchen equipment: “strainer, tongs, baking tray, colander.”) From time to time, Linder broke away from this household oasis into more dynamic action, ranging through the stage space in large, looping paths, evoking gasps from the audience when she made that transition. On the whole, however, this was a program of small perspectives. One particularly charming moment came as Linder was kneeling with her back to the audience – short phrases of text were projected onto the upstage curtain, and then animated so that they moved along the wall. 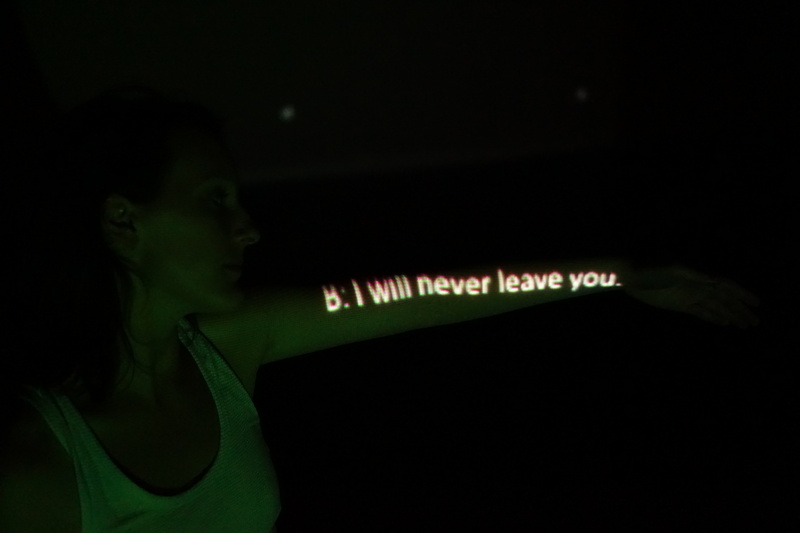 Linder made herself into a human screen, positioning herself so that the text “crawled” up one arm, across her upper back, and down the opposite arm. First the words ran side to side, then they took a 90° turn and scrolled up her raised arm. Finally, the individual letters seemed to fly off her fingertips, heading out into the ether to create a little solar system projected on the upstage curtain. The letters spun and circled, finally lining back up in sentence order, restoring a sense of equilibrium for a moment. Zanki had one last trick to play, projecting a wall-sized image of an apartment block, a cozy red brick building in a hazy snowstorm. We cannot see the snow accumulate – it just continues to fall – but just as we become hypnotized by the process the image shifts again, to a swirling bowl full of flowers. As Linder performed a litany of gestures that could have been copied from the audience (hand to face, arms swinging and crossing), we watched the eddying water slow down to a gentle wave, and then the lights went out once more. Most of the time, seeing is believing, but with 365, we aren’t so sure we know what we’ve seen. 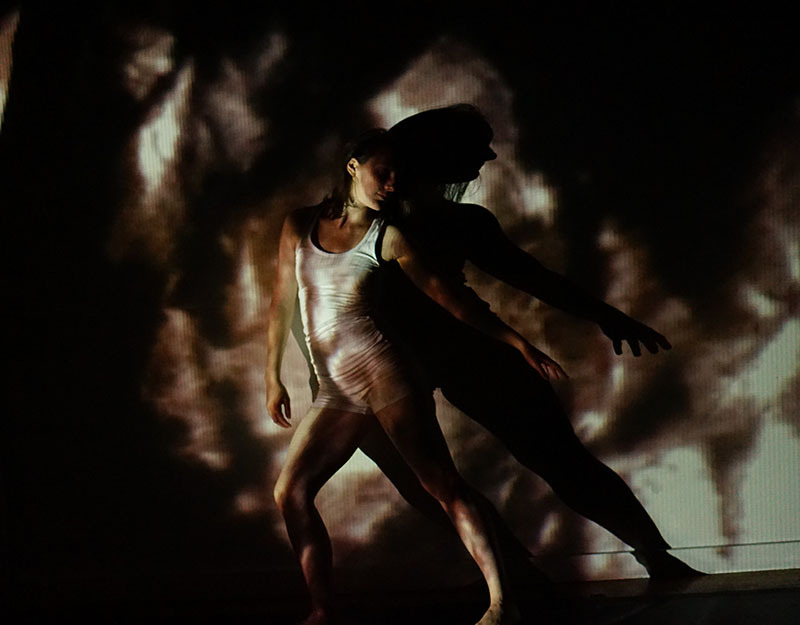 365 – a solo premiered September 1-2, 2016 at Velocity Dance Center. Find out more about Petra Zanki’s work at https://othersproduction.noblogs.org.